U.S. negotiators need to close the TPP before detractors and competitors bury it. Courtship is tricky enough between two people. Imagine trying to negotiate a prenuptial agreement with ten suitors, while children cause strife at home. This is the conundrum faced by the Obama administration, which now faces significant international and domestic opposition to two major trade initiatives: the Trans-Pacific Partnership (TPP), and the Transatlantic Economic and Trade Pact (ETP). Both are still in negotiation, but it is not too early to distinguish their relative merits. The TPP is more advantageous given the growing importance of the Asia-Pacific, the declining fortunes of Europe, and the problematic nature of EU regulation. Meanwhile, the Regional Comprehensive Economic Partnership (RCEP) is gathering steam in Asia, led by China. Unless the White House puts Europe on the back-burner to focus on Asia, President Barack Obama will leave office having failed to significantly advance American interests in free trade. He needs to put his shoulder behind a swift ratification of the TPP. Politics in Washington has become a zero-sum game, and the successful conclusion of any free trade agreement with the United States can only be reached with the support of both houses of Congress. Such agreements are also subject to the domestic political consensus of signatory countries. As a result, the ratification of such agreements requires lengthy negotiation, and the expenditure of considerable political capital. The concurrent pursuit of two major trade agreements will probably result in the failure of both. The TPP would more profitably link the U.S. to dynamic economies of the Asia-Pacific; including Australia, Brunei, Chile, Malaysia, New Zealand, Peru, Singapore, Vietnam, Mexico and Canada. Excluding the U.S., the TPP would have a combined GDP of over $11 trillion. * This is still somewhat less than the European Union. However, other factors make TPP nations more appealing to U.S. economic interests. While the TPP would encourage increased economic interaction with many of the most vibrant economies in the world, the ETP would focus American trade policy towards Europe – a continent of moribund economic and demographic countenance. The population of the European Union is forecast to decline with increasing speed over the next five decades, and economic growth remains generally senescent. The Asia-Pacific already accounts for sixty percent of global GDP and fifty percent of international trade. The region is expected to record more than five percent growth this year and next. The EU and U.S. already enjoy the most integrated economic relationship in the world. The U.S. invests three times more in the EU than in all of Asia combined. EU investment in the U.S. is eight times higher than the sum of EU investment in India and China. Some may suggest that this indicates America should focus her policy attention on fully exploiting this primary relationship, but this can hardly be justified on economic grounds. In fact the reverse is true. Trans-Atlantic economic integration is near full bloom. Trans-Pacific trade relations are comparatively immature, demonstrating strong potential for growth, and are more deserving of the finite policy attentions of the Obama administration. Economic gravity ensures that European fortunes will probably always be tied to American consumers. America will remain Europe’s largest market, but the U.S. is unencumbered by Europe’s dictates of geography. Forging an ever-more perfect trading union across the Atlantic can wait until the U.S. is ready. The dynamic economies across the Pacific will not. Extensive negotiation towards a free trade agreement with Europe offers little economic incentive to the United States above the status quo. The reduction of already low average tariffs (approximately 3 percent) would probably not stimulate positive trade growth with Europe sufficient to offset that continent’s negative economic and demographic trajectory. The most positive reforms of an ETP would stem from the reduction of Non Tariff Measures, such as regulatory divergence. In the best possible case, eradicating the Non Tariff Measures which disrupt trans-Atlantic trade would benefit the EU GDP to the tune of €122 billion, and the U.S. GDP €41 billion, according to EU forecasting. While clearly advantageous to the EU, the relatively small sum likely to flow to the United States is not worth the diplomatic chase. Moreover, there is no guarantee the U.S. could secure any meaningful reduction of complex Non Tariff Measures from the notoriously over-regulated European Union. In contrast, the United States and Asian countries frequently subject one another to high tariff duties. For example, in 2011 the United States exacted tariffs averaging 11.4 percent on imported clothing and 7.9 percent on textiles. Chinese duties on transport equipment and manufactures hover around 12 percent. Clearly, there is more scope for the U.S. to expand international commerce by liberalizing trade policy with Asia than can be weaned from Europe. ASEAN’s ten member states – along with Australia, China, Japan, India, South Korea, and New Zealand are now working towards the world’s largest-ever regional trade agreement, the Regional Comprehensive Economic Partnership (RCEP). This proliferation of free-trade agreements will proceed with or without U.S. involvement. It is in American interests to exercise leadership in designing this system, or risk becoming politically and economically isolated in the region. China’s promotion of the RCEP threatens just that. While initial membership of the TPP would not include many of Asia’s largest economies (such as China), signatory countries share a similar trajectory of growth and will each benefit from proximity to these significant emerging markets. Moreover, the TTP is widely considered a prelude to far broader economic integration, encompassing much (if not most) of the Asia-Pacific. The TPP could establish a framework for other countries to sign on without being subject to the exhausting negotiations required for bilateral agreements. Countries could simply elect to join the TPP, via what has been described as a “docking” arrangement. As one representative of the AFL-CIO states, the TPP could be the last trade agreement the U.S. negotiates. 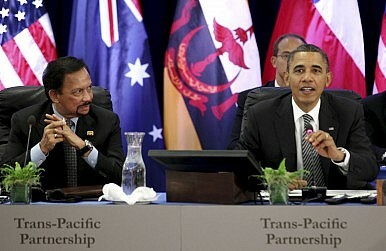 From now on, other countries could simply elect to join the Trans-Pacific Partnership. Obama has invited China to join the TPP, and the agreement could form a building block towards a wider Free Trade Agreement of the Asia-Pacific Region (FTAAP) – a goal endorsed by APEC leaders in 2006. Such an outcome is to be encouraged. It would buttress America’s economic stake in the Asia-Pacific for the foreseeable future, as well as encourage U.S.-Sino cooperation across a range of international issues. One such issue likely to be addressed by the TPP is the protection of U.S. intellectual property. The requirement for “adequate and effective protection and enforcement of intellectual property rights” was clearly enunciated in Article 1.1 of the TPP Main Agreement. Indeed, the TPP is reported to establish binding rules on everything from service-sector regulation, investment, patents and copyrights, government procurement, financial regulation, and labor and environmental standards, as well as trade in industrial goods and agriculture. Action across all of these issues is more urgent among the developing countries of the Asia-Pacific than in the prosperous EU. The TPP not only offers clear economic advantage to the U.S., but also complements the grand strategy of American rebalancing towards the Asia-Pacific. It will enable the Obama administration to help draft the blueprints for increased Asian integration and economic growth, cementing American leadership in the region. This is not a matter of choice, but an economic and strategic necessity. The ETP would doubtless help streamline U.S. – EU trade. But in a highly contested legislative environment, where the ratification of major trade agreements requires the investment of precious political capital, that capital is better invested in the TPP. After decades of trimming her sails across the Atlantic, it is time for the United States to unfurl the spinnaker and make haste for the Asia-Pacific. Christopher Johnston is a Fellow at Georgetown University’s Institute for the Study of Diplomacy. Trump Killed TPP. What's Next For Trade in Asia?Trans-Pacific Partnership: Hawaii Talks End Without DealAfter APEC, Whither the Trans-Pacific Partnership?‘Free’ Trade and the Sovereignty SqueezeCould the TPP Actually Divide Asia?